A new way to be a "global" scientist-philosopher. ...and don't forget that Science is also curiosity, wonder and fun! Paul Umbanhowar (Texas) described an experiment at last month's American Physical Society (APS) meeting in St. Louis, in which the effects of air between the grains and the interaction between the grains and the walls were minimized by using a wide, shallow container. When the grain sample is vibrated, numerous patterns form: stripes, hexagons, and baseball stitches. When the layer thickness is of exactly 17 particles, novel localized structures appear. 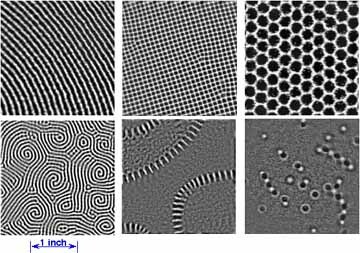 According to Umbanhowar, these "oscillons" are like ripples in a pond but with an important difference; they do not spread out and they can form bound states. In the April issue of Physics Today the authors Heinrich Jaeger, Sidney Nagel, and Robert Behringer explain: Consider sand contained in a tall cylinder. The pressure in the cylinder does not increase indefinitely with depth, as it does in ordinary fluids. Rather, the pressure does not exceed a certain maximum value because the contact forces between grains and friction between grains and the walls cause part of the weight of the overlaying material to be imparted to the walls. Another property which sets granular materials apart from other fluids is the tendency (in a vibrated tank containing particles of differing sizes) for the larger objects to float to the top regardless of their density. Part of the reason for this is that the smaller particles fall into the voids between the larger particles, making it difficult for the larger ones to move downwards (especially along the walls) as part of a convective flow. The properties of granular media in technological issues is clear, as in packaging, mixing, sifting, mining, and erosion processes, but the universe itself may exhibit a sort of granular arrangement. One simulation of granular gases involving a large sample of inelastically interacting hard disks resulted in the "inelastic collapse" of the system into a foam of chainlike structures roughly resembling the distribution of galaxies in the cosmos. The Physics Today authors speculate that the role of gravity in shepherding galaxies may be analogous to the role played by container walls in shaping granular fluids into clusters. At the cosmological level, the "grains" would be stars and galaxies. From the Editor: Easter Egg Surprise! Did you think that The Armchair Scientist was stuck to the December issue? Well, almost, but now here it is with this rich issue coming out exactly on the Easter day, which should be a hint about the rush I made to prepare it! This new e-magazine has two goals: to present scientific results and achievements in an attractive and unimposing way and, at the same time, to stimulate the quest for a new way to do science in spite of the deluge of information going on in our society. The interface between the magazine, the readers and the contributors, making it easy to interact by following short and easy procedures. It should be improved with your help. For writing down your comments while reading the magazine please open the icon on the right holding down the mouse button and selecting the option "open in a New Window". Why water shrinks when warmed? In this issue a very clearly written article, "Beyond Einstein" by David de Hilster, will introduce you to Autodynamics. After the second issue the mail reached an alarming level, and it took a big part of my time to answer and process all the readers' messages. Some of them are reproduced here, as they can be of general interest. Here you can find the index of old issues so that you can easily search for old material or useful references. You can browse them online or, if you prefer, you can download any one of them as a single zipped file that you can read at leisure offline, from your hard disk. For the people who are not satisfied with all the above and prefer to dive personally into the cyberspace...at their own risk! Use this Altavista-Digital Search Form to search the Web and the Newsgroups with a minimum of effort and at amazing high speed. David de Hilster - the article "Beyond Einstein - Autodynamics"
Andrew Nowicki - the article "Earth-To-Orbit Transportation Bibliography"
Following the collaborative spirit of Internet I hope that some of you readers, scientists, philosophers, amateurs, will be interested enough to start helping "The Armchair Scientist" in any way you can think of. Everybody is welcome and I invite all of you to take an active part in the game. Obviously all published material will be credited to its original author. Remember that if everybody gives a little all of us will receive a lot! Note: while reading this magazine you can use the armchair icon to come back to this Cover Page, and the page icon to return to the last used Index, in a hyerarchical way.